Steady rain has shifted east of the Finger Lakes, but a few showers will remain scattered about for Tuesday. 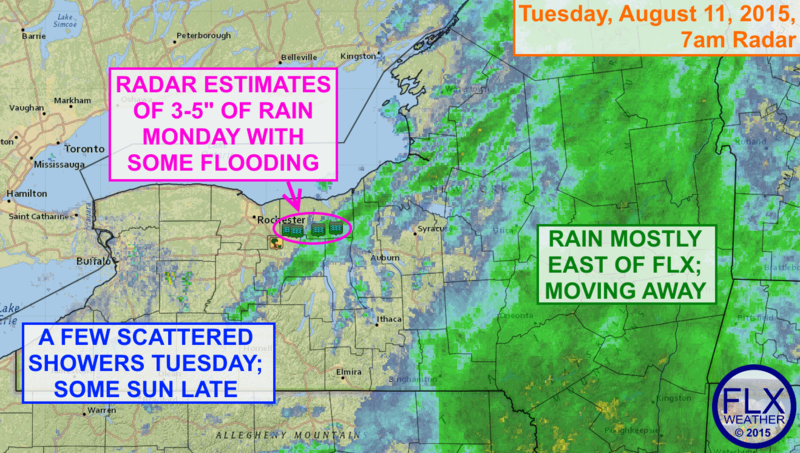 A slow moving area of steady rain moved across the Finger Lakes last night. 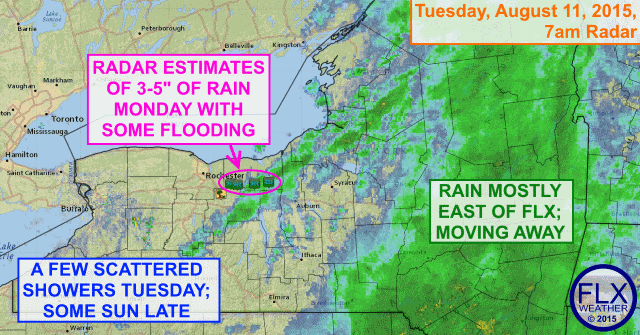 This rain developed on Monday across western New York, initially starting as some stationary thunderstorms. These thunderstorms were particularly hefty across Wayne county, where radar estimates of 3-5″ of rain resulted in some localized flash flooding. Thankfully though, the recent dry weather kept the rest of the region problem free, and even the Wayne County flooding could have been worse had it fallen in the midst of a wet period, such as in June. Some more rain will be possible for Tuesday, but it will mostly be some spotty showers. The chances for these showers will slowly diminish as the morning turns into the afternoon, and there is even a possibility of seeing some sun late in the day. Temperatures today will be mostly in the low to mid 70s. A few more showers may develop tonight and into Wednesday, but most of that rain should be fairly scattered and light. Thursday and Friday are looking dry, with temperatures returning to the 70s and 80s after highs in the upper 60s on Wednesday.